Raseborg is a town and municipality of Finland. Family-friendly places like Teijo national park and Tulliniemi Nature Path will thrill your kids. Step off the beaten path and head to Bellevue Beach and Raseborg Castle. Change things up with a short trip to Ruukin kehräämö ja puoti Oy in Pernio (about 50 minutes away). To find photos, maps, other places to visit, and tourist information, go to the Raseborg tour itinerary maker . Tel Aviv, Israel to Raseborg is an approximately 10-hour flight. Traveling from Tel Aviv in August, you will find days in Raseborg are slightly colder (23°C), and nights are colder (12°C). Wrap up your sightseeing on the 7th (Wed) to allow time to travel to Pori. Pori is a city and municipality on the west coast of Finland. 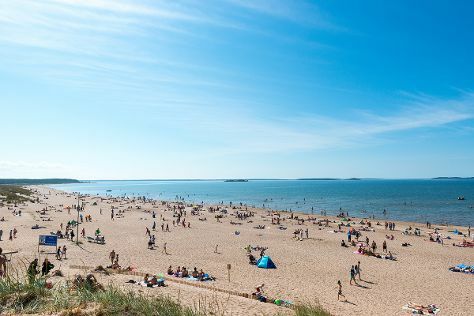 Kick off your visit on the 8th (Thu): kick back and relax at Yyteri Beach, contemplate in the serene atmosphere at Central Pori Church (Keski-Porin kirkko), then get engrossed in the history at Rakennuskulttuuritalo Toivo Ja Korsmanin Talo, and finally have some family-friendly fun at Space Bowling & Billiards. To see more things to do, maps, photos, and more tourist information, go to the Pori day trip site . You can drive from Raseborg to Pori in 3 hours. Expect a daytime high around 22°C in August, and nighttime lows around 12°C. Finish up your sightseeing early on the 8th (Thu) so you can travel to Savonlinna. Kick off your visit on the 9th (Fri): take in the spiritual surroundings of Kerimaki Church, examine the collection at Lusto - The Finnish Forest Museum, take in the architecture and atmosphere at Pikkukirkko, then explore the historical opulence of Olavinlinna Castle, and finally see the interesting displays at Savonlinna Provincial Museum. To see maps, traveler tips, where to stay, and other tourist information, read our Savonlinna online trip maker . Getting from Pori to Savonlinna by flight takes about 6 hours. Other options: drive; or do a combination of train and flight. In August in Savonlinna, expect temperatures between 22°C during the day and 13°C at night. Cap off your sightseeing on the 9th (Fri) early enough to travel to Kuusamo. Kuusamo is a town and municipality in Finland. Kick off your visit on the 10th (Sat): identify plant and animal life at Wildlife Areas and then take in breathtaking views at Kiutakongas Rapids. On the 11th (Sun), you'll have a packed day of sightseeing: look for gifts at Shopping Center Kumpare and then tour the pleasant surroundings at Pieni Karhunkierros Trail. For reviews, maps, photos, and other tourist information, go to the Kuusamo road trip tool . Fly from Savonlinna to Kuusamo in 5 hours. Alternatively, you can drive; or do a combination of train and flight. August in Kuusamo sees daily highs of 20°C and lows of 10°C at night. Wrap up your sightseeing on the 11th (Sun) to allow time to travel to Helsinki. 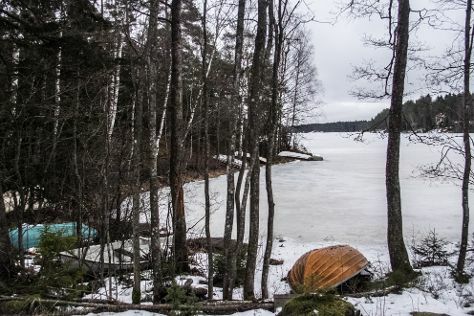 You'll discover tucked-away gems like Seurasaari Island and Open-Air Museum and Nuuksio National Park. Sea Fortress Suomenlinna and Rock Church are good opportunities to explore the local culture. Next up on the itinerary: admire the masterpieces at Kansallisgalleria, take in the architecture and atmosphere at Helsinki Cathedral, hunt for treasures at Hakaniemi Market, and test your team's savvy at popular escape rooms. To find where to stay, maps, reviews, and more tourist information, go to the Helsinki online tour planner . Traveling by flight from Kuusamo to Helsinki takes 3 hours. Alternatively, you can drive; or do a combination of bus and train. Traveling from Kuusamo in August, expect nights in Helsinki to be about the same, around 13°C, while days are somewhat warmer, around 24°C. Finish your sightseeing early on the 14th (Wed) to allow enough time to travel back home.